WESTERLY, R.I. – Sept. 24, 2018 – The inaugural Save The Bay Nature Cruise of the 2018-2019 season will depart from Viking Marina in Westerly, R.I. on Saturday, Oct. 13 at 11 a.m. The 90-minute tour cruises down the Pawcatuck River into Little Narragansett Bay. From the deck of the M/V Elizabeth Morris, riders can enjoy the autumnal landscape while on the lookout for a variety of local wildlife, such as great blue herons, red-tailed hawks, ospreys and, of course, harbor seals. Westerly tours will be held every Saturday, Oct.13-Dec. 29; on Monday, Nov. 12; and daily from Dec. 27-31. 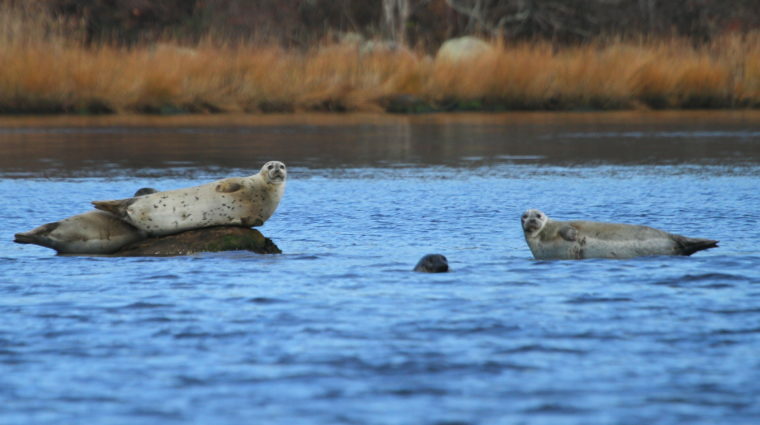 During cooler months, seals migrate south to Rhode Island. Save The Bay’s Nature Cruises offer wildlife lovers the chance to observe these playful creatures in their natural habitat. Tours on Oct. 27, Nov. 17 and Dec. 27 will include guest presentations by Mystic Aquarium specialists Dr. Allison Tuttle, vice president of biological programs; Janelle Schuh, animal rescue program manager; and Sarah Callan, assistant manager of animal rescue program. During their presentations, Mystic Aquarium special guests will join Save The Bay staff to present insights about seal biology and behavior to tour attendees. For over 15 years, Save The Bay has offered seal tours from October through April—when harbor seals migrate south into local waters for food. Save The Bay’s partially-covered, 30+ passenger vessels and binoculars allow visitors to observe winter seals in their natural habitat. During the tours, Save The Bay marine experts provide expert narration of Rhode Island’s official state marine mammal. While Westerly tours begin on Oct. 13, Newport’s one-hour seal tours will begin Nov. 10 out of Bowen’s Wharf and continue through April 25, 2019. Two-hour seal and lighthouse tours, also in Newport, will run Nov. 17-April 28. Tickets, gift certificates and more information are available at 401-203-SEAL(7325) or savebay.org/seals.